The Vale mining company says that Dam I of the Córrego de Feijão mine was more than 280 feet high and 2,360 feet wide, holding a volume of 11.7 million cubic meters. 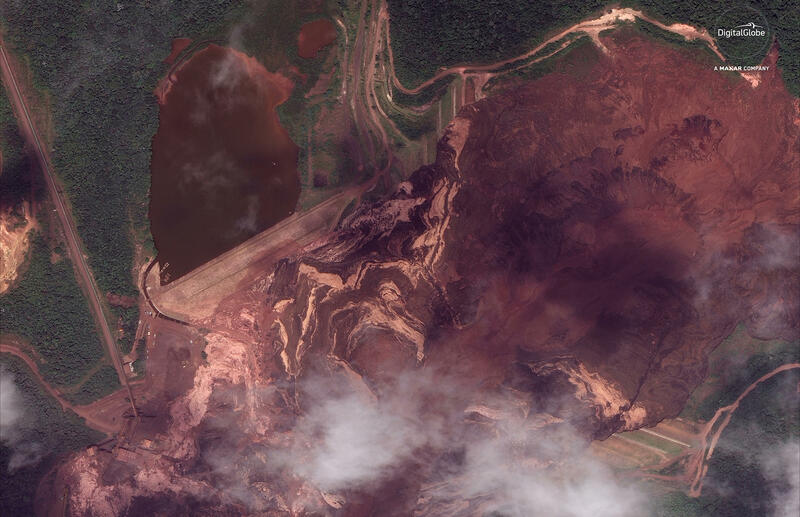 The ruined mine near Brumadinho, Brazil, is seen here in a satellite photo from Jan. 26. Search crews are looking for up to 300 missing people in southeastern Brazil, after a dam at an iron ore mining complex collapsed Friday, releasing a deluge of muddy mine waste that swallowed part of a town. Since then, the death toll has risen to 60, according to Brazilian media outlets citing the area fire brigade, and the safety practices of the mine's owner have come under scrutiny. "Authorities say many of the missing are likely buried deep in mud," Catherine Osborn reports for NPR from Brumadinho. When that potential risk spiked on Sunday, a siren blared an alert, further unsettling thousands of residents. But it seems that the public might have received little or no public warning of Friday's catastrophe. The Vale mining company tells The Associated Press there are eight sirens in the area around its dam that failed — but that "the speed in which the event happened made sounding an alarm impossible" on Friday. Mine worker Luiz Castro told Osborn that he had been taking iron ore to a grinding machine when he heard a loud noise, like the sound of giant truck wheels exploding. Turning, Castro saw what he calls a "mountain of mud" — from a dam that held more than 3 billion gallons — bearing down on the building where he worked. He ran for his life. The mine waste and mud had been held back by Dam I of the Córrego de Feijão mine, which Vale says was more than 280 feet high and 2,360 feet wide. The company says the dam on the outskirts of Brumadinho had surpassed safety standards when it was inspected in June and September of last year. Satellite images of the area show a dramatically redrawn landscape. The area below the dam, where dense tree cover, buildings and small ponds once stood, is now covered in rust-colored muck. 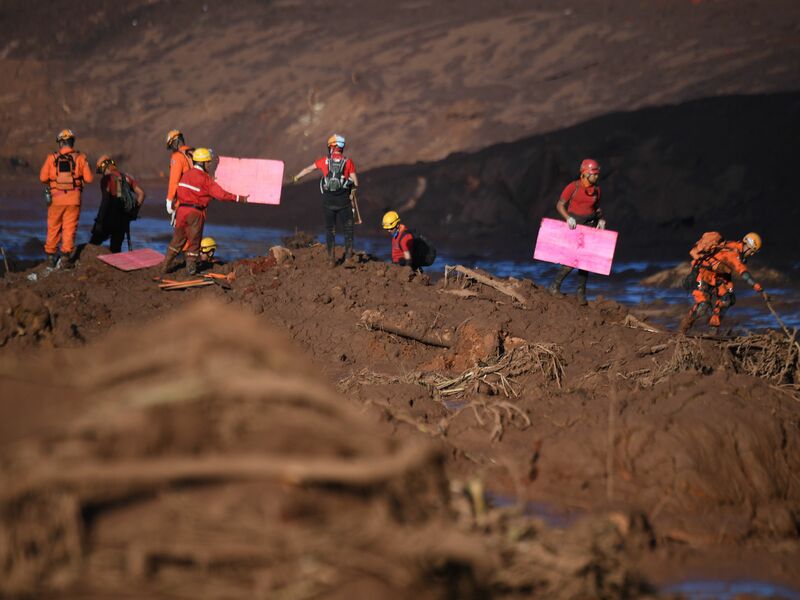 Rescuers search for vicitms near the town of Brumadinho, in the state of Minas Gerias, southeastern Brazil, three days after the collapse of a dam at an iron-ore mine belonging to Brazil's giant mining company Vale. The red mud has reached the Paraopeba River in the center of Brumadinho, reports O Globo, which adds that according to the locals, the river had been known for having the most fish in the Paraopeba Valley, an area in the state of Minas Gerais bracketed by several mountain ranges. As residents grapple with the scope of the tragedy, legal proceedings against Vale are already under way. Two government agencies have hit the company with sanctions over the mine collapse. And over the weekend, judges issued preliminary injunctions freezing nearly $3 billion of Vale's accounts to preserve money for potential payments for victims, reparations and other costs. Vale bills itself as the world's largest iron ore and nickel producer, and it's a powerful force in Minas Gerais, a state well known for its mines. But many residents blame the company for Friday's collapse and question whether Vale did enough to improve its safety protocols after a similar collapse killed 19 people in 2015. "It was negligence — and it was a crime," resident Dilce Almeida tells Osborn. A retired clothing vendor who said she spent the weekend trying to learn the fate of her nephew, Andre. Ibama, Brazil's ministry of the environment, imposed a fine of 250 million reals ($66 million) on Vale on Saturday, saying it was guilty of five different infractions, from causing life-threatening pollution to releasing mining tailings into water resources. A state agency in Minas Gerais added its own fine of nearly 100 million reals. But as the disaster's toll continues to rise, residents and a relief official are calling for the government to improve how it manages the risk of dams collapsing at Brazil's mines. "Federal officials have pledged to make mining regulations more strict," Osborn reports. "But for many, this disaster has laid bare the difference between pledges and enforcement."